Once we are aware that certain music has been written for film, it's easy to wax poetic about said music's visual associations. Yet I believe that one needn't be aware of Greek composer Elenei Karaindrou's filmic motivations in order to feel it in the same way, for hers imagines, recites, and sings the lament of a zeitgeist in decay. Saxophonist Jan Garbarek is very much at home in the quiet throes of "Farewell Theme" and lends his focused energy to a nexus of strings and santouri that, in a short span, scales the heart's deepest cliffs. This piece both begins and ends a disc comprised of Karaindrou's best from the 1980s, and is also the longest. "Elegy For Rosa" and "The Journey" are among the briefer portals into the album's blinding refractions, such as "The Scream" and "Return," the latter something of an anthem in its present context. The chromatically inflected evocations of "Wandering In Alexandria" quiver with curiosities, as if lost in a land one has forgotten. The oboe of "Adagio" spins a rope of travel across the sky, sending down threads of hope into "Fairytale" and "Parade." These recurring themes bow in deference to the cradle of "Rosa's Song," in which Karaindrou's own voice rings like a slow-motion slingshot into the improvisation that follows. This collection pours its remaining jewels from a silken pouch, bringing us back through Alexandria and into the folds where we began. 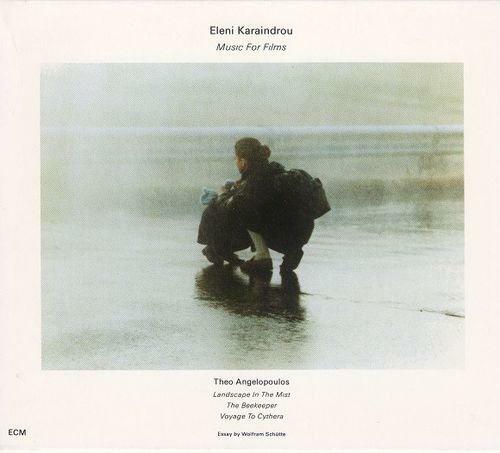 Eleni Karaindrou - Music For Films (1991) download links are externally hosted on Extabit, Rapidshare, Rapidgator, Netload, Uploaded and Eleni Karaindrou - Music For Films (1991) also available directly on Torrent Sources.